Re-branding a fleet can often seem like a monumental task. Old graphics have to be removed. New graphics installed. Numerous measurements need to be taken. And the biggest hassle of all? Coordinating with drivers to get vehicles in for installs. When the majority of your work is done from a truck, setting aside a 4-8 hour window for branding can be difficult. 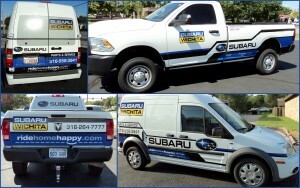 We recently had the opportunity to help Subaru of Wichita brand their fleet. And what a smooth process it was! Check out their newly branded fleet vehicles below. The re-branding process doesn’t have to be overwhelming. We offer graphic design services, professional installation, and only use quality materials. Let us help streamline the process and get your fleet back on the street as quickly as possible. To view more photos of fleet graphics we’ve done, check us out on Facebook.